Here's an easy way to make use of your farmers market finds. Don't forget, it's still Massachusetts Farmers Market Week and you can help support the market with a donation of any size at http://www.massfarmersmarkets.org, just click on donate. To check out some other great blog posts celebrating the markets visit In Our Grandmothers’ Kitchens. Now, onto tonight's recipe. I wasn't planning on posting this while I was cooking - I just took a couple pictures with the plan of tweeting them. But my plan changed as soon as I took the first bite. Tonight's dinner was quick to prepare (thanks to some cooking earlier in the week) and full of great flavor. Even better - it was almost all local! Last week I picked up some yellow cherry tomatoes from Ward's Berry Farm at the Boston University Farmers Market. On Sunday I roasted them with some olive oil and kosher salt. They made a great topping for pizza bagels and then I put them in the refrigerator and forgot about them until tonight. After reading about hard neck garlic over at Local in Season today, I picked up two heads from Atlas Farm during my after work trip to the Copley Farmers Market. Not related to tonight's dinner I also picked up a leek and some local potatoes to turn into soup tomorrow. And the BEST part of my visit to the market today - ground cherries are back! These look like baby tomatillos - but have a personality all of their own. A little tart, a little sweet, and so addictive. I can polish off an entire container in one sitting. Even peeling off the little husks doesn't slow me down. Next year I'll have to try growing these in my expanded garden. Until then, I will buy as many as I can before they go out of season. Now, back to dinner. My basil plants really enjoyed these rainy days and I had a lot to use. This was the finishing touch for dinner. The sauce was spicy from the garlic, but sweet from the tomatoes. The basil was bright and summery. I'm sitting here licking my lips just thinking about it. I might have to go heat up the leftovers for dessert. I have simple recipes like this. I have a lot of cherry tomatoes in my fridge now and this inspired me to put it to good use! I've never cooked with yellow tomatoes before - your dish looks delicious!! I wish I could pass of whole wheat pasta to the family. . . so far, no such luck! 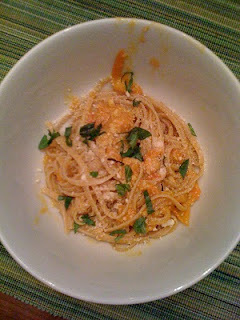 Ooh... that roasted yellow tomato sauce looks so, so good. Great use of your farmers' market finds. That yellow tomato sauce looks so beautiful! I've never seen ground cherries before. I'll keep my eyes out!